Learning how to draw eyes is regarded by many artists as a fundamental skill. The reason being that eyes are considered one of the most important facial features. Just by looking at them we can tell if a person is angry, sad, happy or playful. Consequently, it’s imperative that they are drawn correctly and in such a way to convey the feeling of your subject. 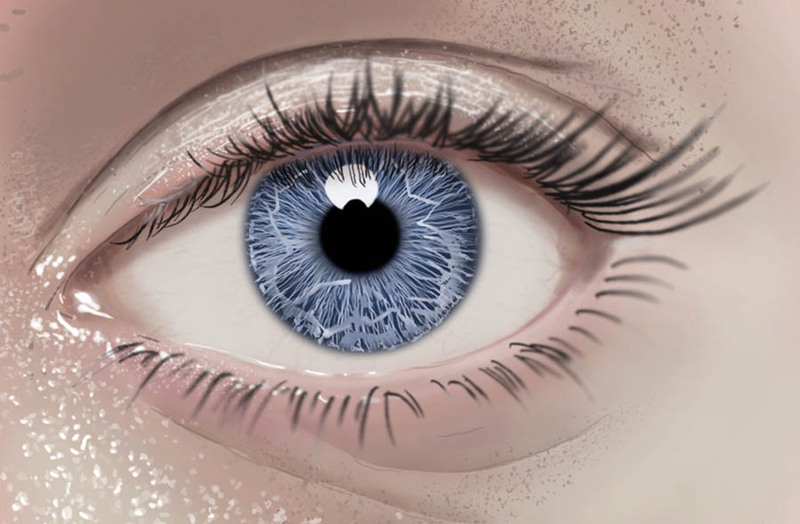 This tutorial is thought to be a first step along the pathway to good eye drawing and it is intentionally not complicated. The eye drawn within the tutorial is semi-realistic because I want you to focus on more general aspects of the drawing and I do not want you to be distracted by too many details at the same time. You’ll see however that even if not perfect, the eye you’ll be able to draw looks pretty good anyway and will allow you to start drawing and practicing immediately. The first thing you need to know is where to position the eye in the face. Contrarily to our deceiving perception of faces, eyes are positioned normally along the midline of the head. Once you have traced the midline and a vertical line to divide the face in two halves, further divide each half midline in three parts. The central of these three segments will be the exact position for your eye! Easy as shown in the image above. Let’s name the main parts that compound the eye: there are the upper and lower lids, the sclera (the white of the eye) the iris ( the larger colored disc) and the pupil (small and black). Let’s get to the juicy part of how to draw eyes now! I have used a 2H pencil for this drawing, if you want to know more about pencils and grades look the pencil article in the drawing supplies section. Let’s start by drawing a rectangle roughly divided in half by the midline you draw on the face. Further divide the rectangle into four parts (I promise this is the last division). From the intersection point on the left (if you are drawing the right eye just invert everything I say :D) trace a first line to the first point as shown in the image. From that point draw three more lines as shown to trace the shape of the eye. Get rid of the grid lines now and add one line for the upper lid and one for the lower lid as shown in the image. Follow roughly the profile of the eye. Now draw the iris and the pupil right in the middle of the iris. Remember, iris and pupil are always concentric and the diameter of the iris is normally slightly longer than the aperture of the eye vertically. Let’s start working a little bit within the iris. I have selected as light direction for the drawing the upper right. It is shown by the small light reflection in the pupil. Draw very thin lines from the center to the border and vice versa until you reach a result similar to the image. Be really light with the touch. A 2H pencil comes really in handy at this stage. For this step I have used a softer pencil, the 2B to enhance the contour of the iris and to draw a bit of shadow on the upper and lower lid. I have smudged it with my finger to obtain this effect. With the softer pencil I have also added few thicker lines at the outer rim of the iris following the same movement you used for the thin lines. the only thing this time do not go all the way in toward the pupil. Let the thin lines br visible underneath the thicker ones. Finally you can increase the size of the reflection on the upper-right of the iris/pupil just by erasing your way through and defining with the 2B pencil the perimeter of the reflection. We are getting there, You have almost learnt how to draw eyes from scratch and without a reference image. With this last step you can add more details to the composition. You can intensify the blackness around the iris to emphasize it and you can also increase the whiteness of the light reflection. The last touch is the eyelashes. To draw them start from the lid rim and draw with a swift movement of the hand moving away from the rim. Arrows in the drawing show how you can do it. Ok, now you have a very basic understanding of how to draw eyes even if this is not a super realistic eye. Before leaving you to more exploration of the Factory and more drawing I want to talk for a sec more about the positioning of the eye in the face. I know this looks a bit creepy but bare with me for a minute. This image represents a schematic view of the tri-dimensional relationship between the eye (which is imaginable as a sphere for our purposes), the eye socket and the eyelids. As you can see from the image, the eye that we see (in orange) is only a small part of the eyeball which is sunk inside the head. Moreover, the eye does not pop from a flat surface on the face but instead pops from a concave surface. This is why the upper and lower eye lids form such prominent and deep lines around the eye. site again for more tutorials on how to draw more realistic and complex eyes!